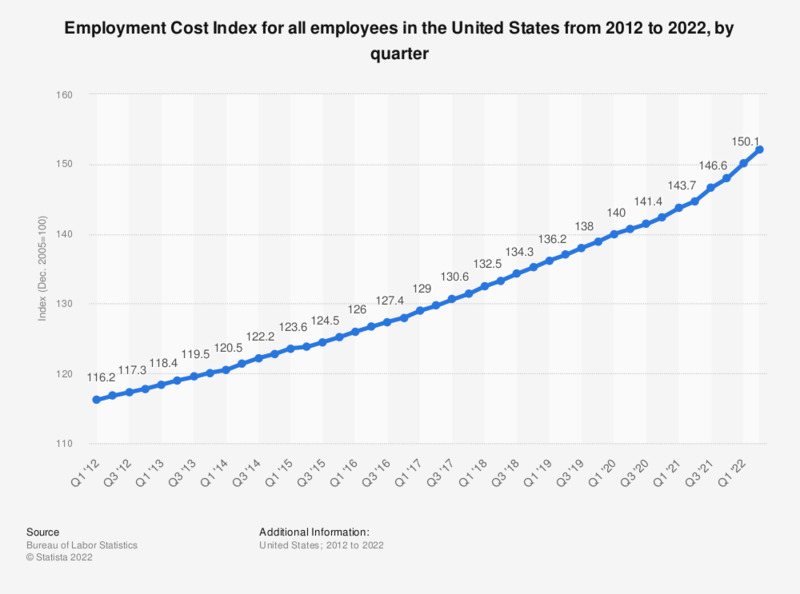 This statistic shows the Employment Cost Index for all employees in the United States from 2010 to 2018, by quarter. The index is based on numbers from December 2005. The Employment Cost Index (ECI) measures the change in the cost of labor, free from the influence of employment shifts among occupations and industries. In the fourth quarter of 2018, the ECI came to 135.2 indicating an increase of labor costs by about 0.7 percent since the preceding quarter. The Employment Cost Index (ECI) measures the change in the cost of labor, free from the influence of employment shifts among occupations and industries. The total compensation series includes changes in wages and salaries and in employer costs for employee benefits. Employer costs for employee benefits are collected for paid leave — vacations, holidays, sick leave, and personal leave; supplemental pay — premium pay for work in addition to the regular work schedule (such as overtime, weekends, and holidays) and for shift differentials, and nonproduction bonuses (such as yearend, referral, and attendance bonuses); insurance benefits — life, health, short-term disability, and long-term disability insurance; retirement and savings benefits — defined benefits and defined contribution plans; and legally required benefits — Social Security, Medicare, Federal and State unemployment insurance, and workers’ compensation. Further information regarding the methodology of the ECI can be found here.